There is some debate in the literature as to whether there is an increased risk of developing eating disorders in individuals with type 1 diabetes. 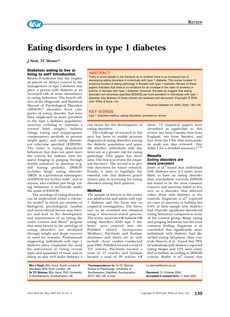 This review located 12 empirical studies of eating pathology in females with type 1 diabetes. Review of these papers indicates that there is no evidence for an increase in the rates of anorexia or bulimia, in females with type 1 diabetes. However, the data do suggest that eating disorders not otherwise specified (EDNOS) are more prevalent in individuals with type 1 diabetes. Key features of these articles are reviewed and discussed. Copyright © 2005 John Wiley & Sons, Ltd.